Pinterest is one of my new favorite obsessions. Most of the things I've pinned I'll probably never make but if it's something sweet and not too complicated I'm all game. I found these and it gave me inspiration to make them for Noah. I decided this around 12PM and Noah gets out of preschool at 1:30 so I knew I didn't have too much time to go all crazy and do recipes from scratch so I opted for white cake mix. It was really easy to color the dye but I found purple was a hard color for me to mix, doh! I didn't have any purple, green or gold sprinkles so I decided to make my own. I took about an ounce of sugar and put it in an air tight container (I actually used my pumping bottles, how is that for reusing things?) 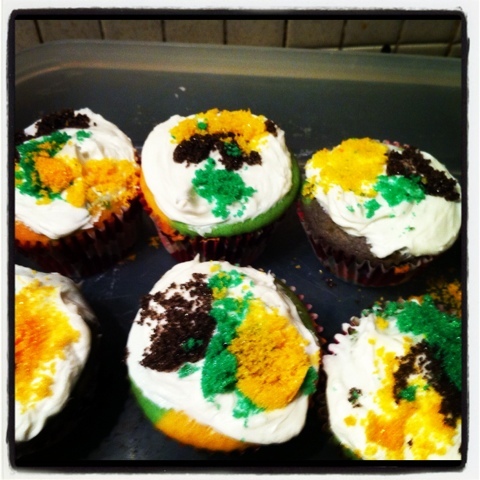 and added the dye and shook it like crazy for a few seconds and VOILA...perfect purple, green and gold sugar sprinkles. Score! And since I was running short on time I just used pre-made vanilla icing. However, I think the cinnamon icing that the recipe called for would be awesome and more yummy than plain 'ole vanilla. So if you need a sweet treat to bring to the neutral ground this weekend whip these up and everyone will think you spent way more time in the kitchen than you actually did.